MALUS was built in September 1935 by WJ Yarwoods and Sons of Northwich for the Grand Union Canal Carrying Company (GUCCC) as part of their expansion program. The order consisted of 12 boats constructed of iron sides and wooden bottom planks (made from elm), known as Small Northwich butty boats. She was delivered on 4th October 1935 and paired with the motor ‘Scorpio’. On entering service with the GUCCC she was given the fleet number 307 – which she still carries today. On the 24th October 1936 she was gauged on the Grand Union Canal and received the gauging number 12412. MALUS was used to carry cargos such as coal, steel, timber and grain from London to the Midlands. In 1944 Pairing lists show MALUS paired with the motor ‘Arcas’. Post nationalisation, MALUS became part of the Docks and Inland Waterways Executive,South Eastern Division. In 1958 Pairing lists show Malus paired with the motor ‘Owl’ (Fleet number 230) and in 1960 Malus was paired with the motor ‘Saltaire’. In the 1970’s (after carrying stopped) Malus was transferred to the canal maintenance fleet in the Birmingham and Midlands area. 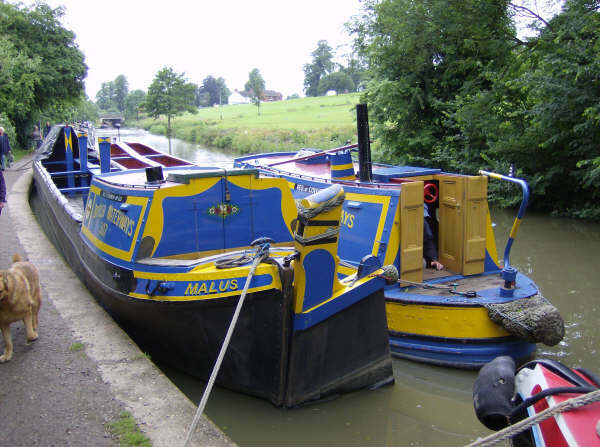 In the early 1990’s MALUS became part of the Heritage Working Boat fleet. 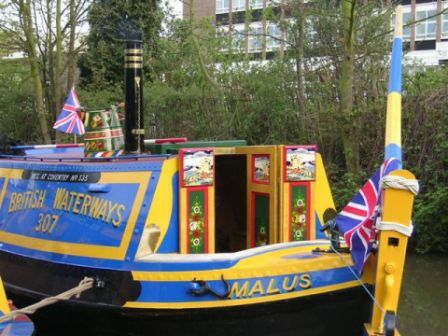 MALUS is now paired with the motor ‘ATLAS’ both having been restored as an example of a pair of 1950’s working boats that would have been operated by a family of two adults and two or more children who would also live in the back cabins. ATLAS and MALUS are frequently at boat rallies and in regular use for for Duke of Edinburgh Gold residential weeks.